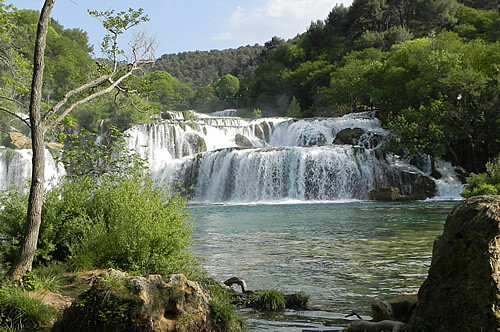 Just inland from Šibenik lies the beautiful Krka National Park. 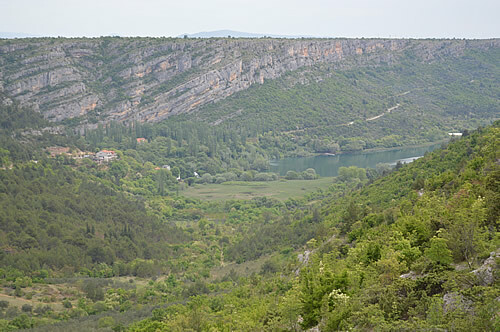 Basically, it’s a deep canyon cut into the high karst plateau by the river Krka as it wends its way down to the sea. 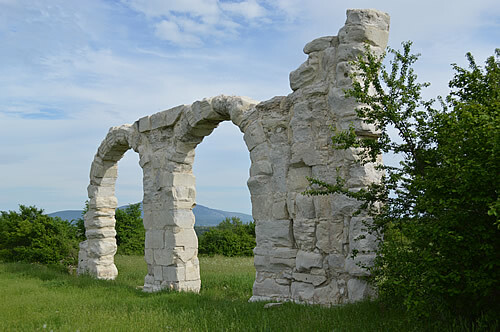 There are spectacular waterfalls, lakes, caves, natural rock formations, interesting flora and fauna – plus there’s cultural heritage, starting with the Illyrians and Romans, and including medieval monasteries, a fortress, watermills and an early hydro-electic power station. 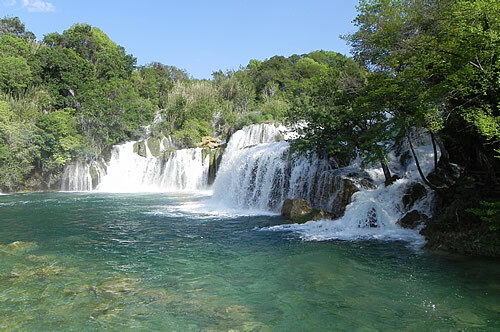 We’ve visited the best-known part of Krka before – the lowest series of waterfalls known as Skradinski Buk. 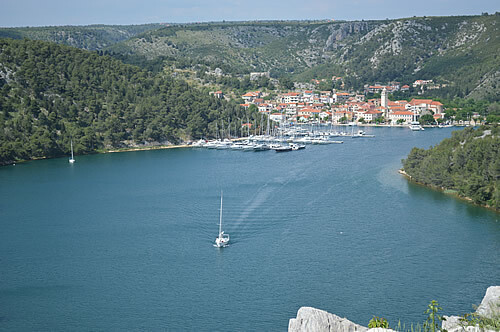 It’s an easy boat-trip from the town of Skradin to the entrance of the national park, with its walkways and scenic views over the roaring water. Buk translates as roar, so you get the idea of serious volumes of water tumbling noisily down. 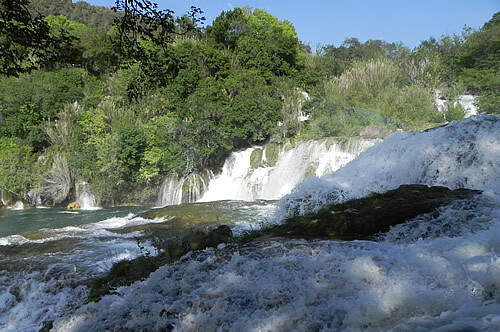 Krka is one of two places in Croatia where you can see such a spectacular series of travertine waterfalls. The other, rather more famous, being Plitvice National Park. The travertine is formed by calcium carbonate being deposited out of the water, creating barriers over which the water then cascades. 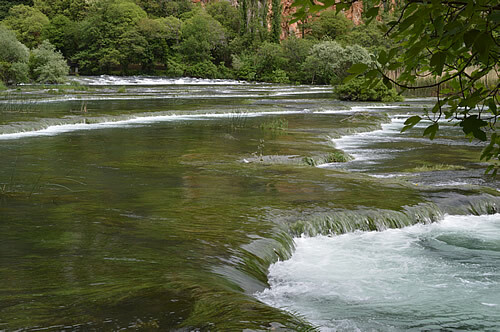 The travertine attracts blue-green algae, onto which grow mosses and more vegetation. 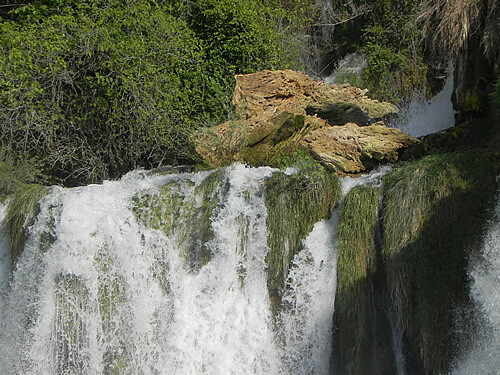 The vegetation shades the waterfalls producing even more mosses and stimulating the growth of more travertine. It’s an amazing sight as the water pours out from amongst the trees all around. Spectacular! Below the falls, the historic power station dates from 1895, and was the first alternating current hydro-electric power station in Europe, second in the world. It was operational just two days after Tesla’s famous hydro-electric plant at Niagara Falls. 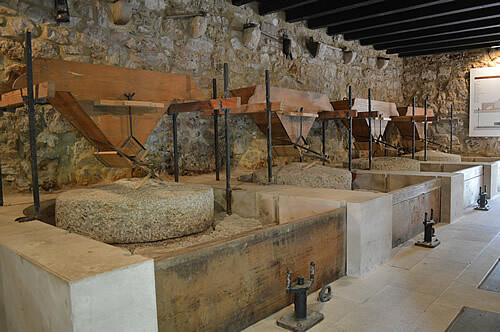 Šibenik, it seems, was a pioneer in electrical power! Separate article to come on this one! For our visit this year, we wanted to explore further upriver, and discover some of the less-frequented areas of the park. We’re taking the car, rather than the boat tours, as it gives us more freedom. First stop, the information centre in Skradin to buy our entry tickets, then it’s off in the direction of Visovac Lake. 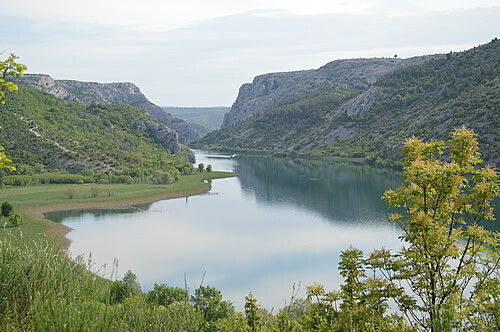 Visovac lake covers a large section of the river between Skradinski buk and the next series of falls upstream at Roški slap. 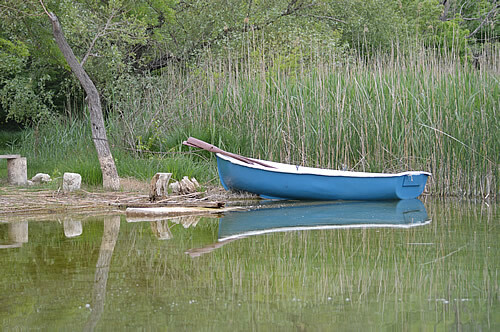 There’s a Franciscan monastry on the island in the centre of the lake, and it’s possible to visit by boat. The monastery is known for its rich archeological treasures, and the collection of early manuscripts and incunabulae in its library. Disappointingly, the boat timetable tells us that there isn’t another crossing for an hour, so we decide to come back to this another day. Instead we take time to enjoy the very peaceful shoreline, and head further upriver. In driving from one part of the river to another, it’s necessary to climb up to the rim, follow the roads across the plateau, then zig-zag back down again to river level. It gives you a chance to enjoy the spectacular views and admire the geology. I do love a good rock! You can see here just how absolutely flat the high plateau is, although the rock pattern clearly slopes upwards. At Roški slap (slap = falls) we drive across on a series of bridges, as the river is pretty wide at this point. Also, at one side there’s a man-made channel that divides off a controlled amount of water to run the mills. 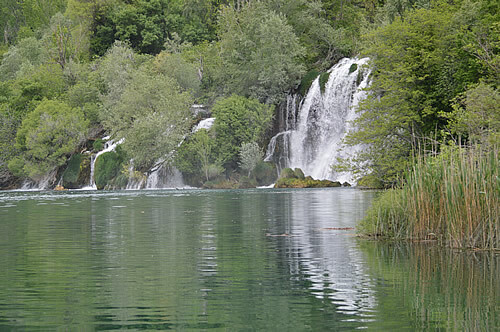 Leaving our car in a shady parking spot, we set off on foot to see the “big” falls as the river drops into Visovac lake. There is a cluster of old watermills here, some renovated to show how waterpower was used in the past to grind wheat into flour. The mill’s customers would have had to bring their grain here by donkey, most likely from the farmland up on the plateau. Each small water channel turns a series of millwheels. 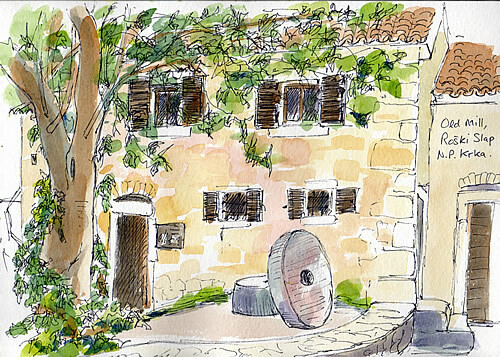 One of the old mills is now a cafe, offering sandwiches and drinks for lunch, and this is a peaceful spot to sit and sketch for a while. Blissfully shady on this rather hot afternoon. A tour boat arrives up the lake, passing us for a closer view of the falls, then circling back to dock at the cafe. It looks like a lovely way to see the river. 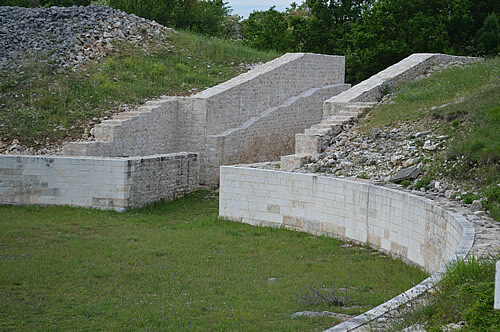 And if you walk up to the top of Roški slap, you can catch a further boat to visit the next section. Some of the new arrivals march off up the hiking trail, while others settle at the picnic tables to enjoy lunch with a view. After lunch, we head upstream for a walk around the upper falls. 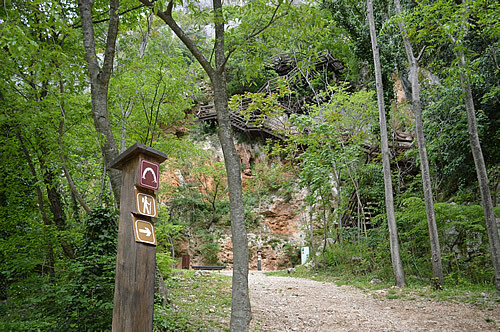 There’s a sign for a cave – and a steep set of wooden steps leading up the canyon wall. As far as we can see, the cave must be somewhere near the top of the cliff, a good way up! This way to the cave! 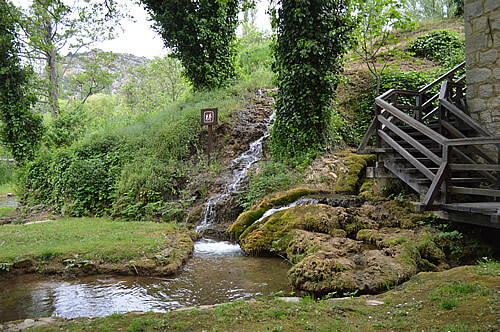 The smaller cascades at Roški slap are known as the “necklaces” by the locals. A wooden boardwalk takes us across the falls for good views. 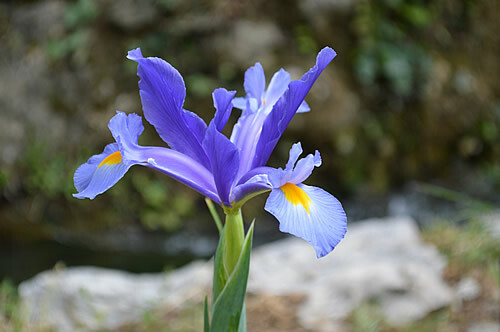 There are butterflies and birds swooping around, wild irises growing in the shallows. 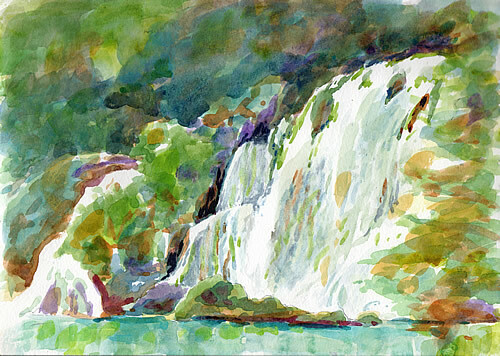 At a small beach, I have another go at painting the waterfalls as I consider I really do need the practice! By now the time is advancing somewhat, and we still want to see Burnum, the remains of the Roman fort. So it’s back to the car and we work out the shortest route using some of the smaller roads. How hard can it be, right? Well, yes. Our map was perhaps a tad optimistic in labelling it a road. It was, in fact, a macadam track for accessing one or two of the smaller villages, so we bounced along it at a fairly slow pace, which admittedly did allow us plenty time to enjoy the scenery! Back on tarmaced roads finally, we crossed the river above Manojlovac falls and back up to the opposite rim. Beautiful views once again! 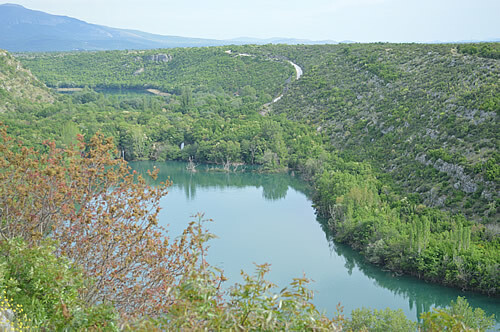 Burnum camp was strategically placed to control the crossing of the Krka river. It was built under the Emperor Claudius, and later expanded under Vespasian. Once the Roman troops departed, the site was used as a town up until late antiquity. The famous arches are what’s left of the pretoria, the camp command building. There they are, standing in a field, completely unsigned. Very impressive. On the opposite side of the road lies the amphitheatre. 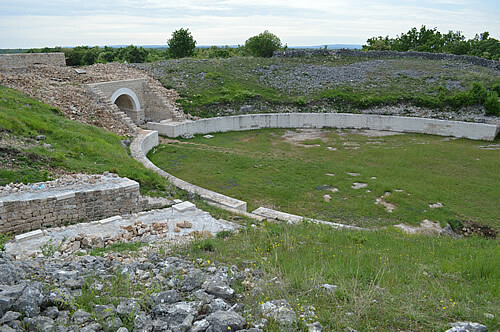 Built in the 1st century A.D. by the troops of the XI Roman legion, it’s the only example of a military amphitheatre in Croatia. There are four entrances, and it’s fairly large construction for a military camp. There’s been some amount of restoration done on the amphitheatre, to give a better idea of how this would have looked when in operation. In its day, it’s estimated that this place could seat about 6,000-10,000 people. 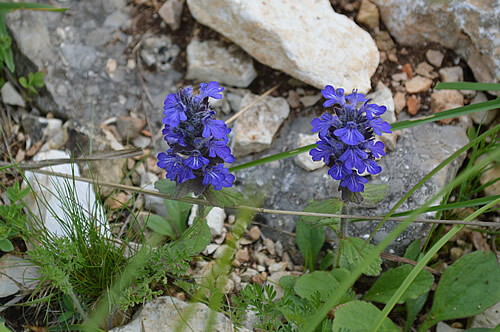 There’s so much more to see in Krka National Park than we managed in our all-too-short one day visit. This has been a pretty good orientation, though, and we now have a better idea of the scale of the place and what we want to see next time. We’ll be back! Firstly the big falls at Roški slap from the boat dock. And the old mill sketched while I munched my cheese sandwich at the cafe. And lastly, a double-page attempt at the “necklaces” from a beach along the walking trail – tough to fit everything in!